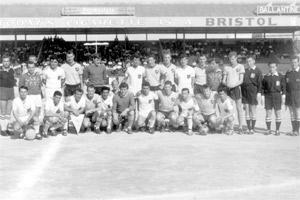 In May 1964, Norwich City visited the islands to play a series of matches against Maltese teams. In those days, the Canaries enjoyed quite a reputation as giant-killers in English football, thanks mainly to their feats in the FA Cup. Their tourney, therefore, created quite a stir in Malta. In the opening match, they beat Sliema Wanderers 4-3. Then, on May 9, 1964 they won comfortably 4-1 against the Combined Services. Today's story, however, is about the English club's third match in Malta when Valletta FC spoiled the visitors' 100 per cent record. The Norwich attack, which had scored eight goals in the previous two matches, failed miserably against a rock-solid and determined Valletta defence. Although the visitors enjoyed territorial advantage and played a superior brand of football, their attack fizzled out in the Citizens' penalty area. It was a misunderstanding between Tommy Taylor and centre-half Joe Cilia that allowed Davies to cancel out an early Valletta goal. The match was keenly-contested, played in the best of spirits from both sides. Norwich played a straight-forward type of football, based on swift through-passes designed to open up opposing defences. In this capacity, Bryceland was their best player, spraying his passes to great perfection. Norwich were especially dangerous on the left flank, mainly thanks to Punton's running. It was from one of his crosses that Davies netted the equaliser. For the first time in their short tour, the English team changed ends in arrears. The ball fell to half-back Charlie Williams who calmly shot well and true into the roof of the Norwich net. This goal encouraged the Whites to increase their efforts. They surged forward, seriously threatening to increase their lead. At the other end, their defence contained the Englishmen's persistent attacks. Norwich tried their utmost to level the scores. In the 15th minute Davies hit the bar with a hard volley and 10 minutes later Punton crashed his way through the Whites' defence only to see his shot scrape the upright. The second half was played along the same lines as the first and the question on everyone's lips was how long Valletta could hold out under such tremendous pressure. In the 50th minute, Punton beat Attard, ran forward and crossed to the centre. Cilia and Taylor hesitated and in nipped Davies to head in neatly past the Valletta goalkeeper. With the Canaries on level terms, the game now turned into a full-pitch battle for supremacy. The scales were tipped heavily against Valletta but their defence, inspired by a gallant display from Cilia, never yielded an inch. The game seemed destined to end in a draw but Valletta still had something left in them. Surging forward in search of a winner, they pinned Norwich in their penalty area. The ball fell to Zammit who unleashed a bombshell from just outside the area which just missed the target. A few minutes later, Zarb broke through and scored but the whistle had already gone for an apparent offside. The final whistle brought to an end the Maltese side's gallant fight against superior opponents but the end result was fair and just. This was confirmed by Mr Westwood, the Norwich secretary who described Valletta as their toughest opponents. He also singled out Cilia as the best player they played against in Malta. Valletta: Taylor, Attard, V. Gauci, Williams, Cilia, Zammit, Calleja (A. Vassallo), Urpani, Zarb, Borg, V. Vassallo. Norwich: Barnett (Keelan), Kelly, Mulliet, Hill, Butler, Allcock, Sutton, Bryceland, Davies, Bolland, Punton. Scorers: Williams (Valletta); Davies (Norwich).